Wonderful people dealing with challenging infrastructure, a lousy economy, and an uncertain future! Weeks with weather like we’re having now are considered AWESOME by those of us who practice a type of Tactical Urbanism called “Guerrilla Gardening“. This involves private individuals and small groups taking action to covertly re-green and add value to spaces and places in a community by planting fruiting shrubs, flowers, or herbs… as much as possible with plants native to the area, and usually with secondary purposes such as medicinal or pollinator-attractors. “Heaven-sent” weather for Guerrilla Gardeners! 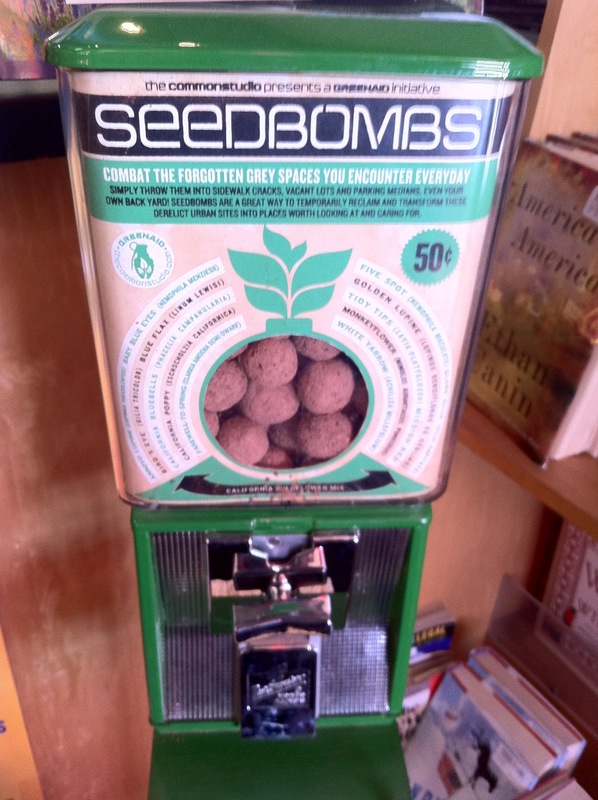 Sometimes it is as simple as lobbing some “seed bombs” (a mix of compost, seeds for local wildflowers, and clay) onto a vacant lot, median, or endless lawn in an industrial/corporate park. Adds color, variety, and supports pollinators. Other times it increases the productivity of ornamental-only fruit trees (like “flowering pears”) by grafting branches from fruiting varieties. As disconnected as we’ve becoming by “zoning” food production away from our homes, this can be a great way (and sometimes the only way) to give suburban kids some connection to where fruit really comes from. What we especially like is “Edible Landscaping” with perennials like berries. A dozen thorn-less blackberry or raspberry starts easily fit in a shoulder bag. Taking a walk or bike ride around the villages to scout-out good spots; what looks like someone stopping to tie their shoes is really a quick scoop with a hand trowel, planting the start along with a handful of compost, a firming of the soil with a footstep, and the “walk” resumes. In a year or two, kids playing in that corner of the park or walking to school, or a family gathering to watch fireworks, or cycling around the village, or commuters waiting for their train make the happy discovery of a handful of fresh berries. When the pendulum swings some more in the current direction, as we come down from the “high” of excess consumerism and waste and return more to a “middle ground”, we’ll see more actions like these become common (and sometimes incorporated into code). Food has to come from somewhere… why not our own community? Our own lots? This entry was posted in Bicycling, Children, Local Food Production, Resilience. Bookmark the permalink. Always some Webinars out there!